"Wei" to go to our project team that just completed the Pei Wei Asian Kitchen in McAllen, which marks their first new-build prototype! McAllen, TX (RestaurantNews.com) Pei Wei’s first McAllen restaurant opened its doors in Palms Crossing last month and is celebrating with a grand opening party on Friday, Nov. 2. The new restaurant, located at 3400 W. Expressway 83, Ste. 190, will kick off its celebration with an official ribbon-cutting ceremony hosted by the McAllen Chamber of Commerce at 10:45 a.m. There will also be a spin wheel onsite that guests can use to win free prizes between 11 a.m. and 3 p.m. Prizes include Pei Wei swag and apparel, free menu items and gift cards. The celebration will continue with FREE Thai Donuts*! From open to close, Nov. 2 through Nov. 4, guests who purchase a qualifying entrée will receive a free order of Thai Donuts. 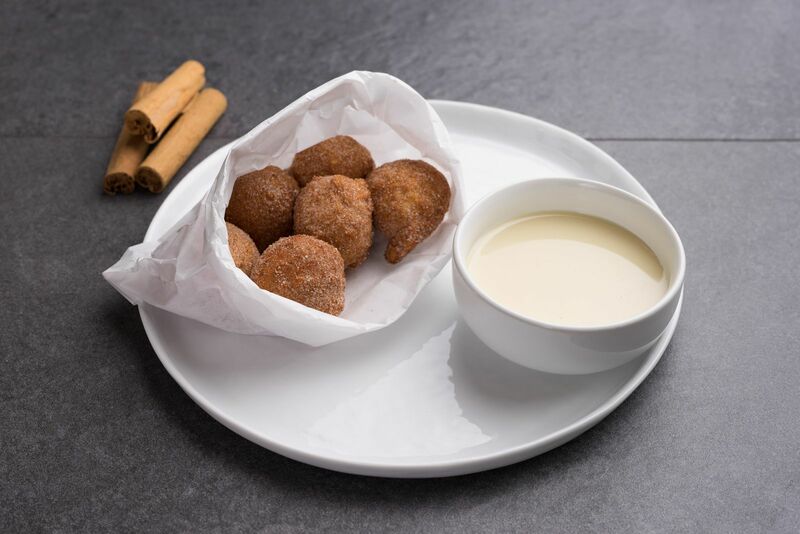 Be prepared to get lost in the indulgent taste of these six warm, scratch-made donuts, freshly fried to order and tossed with Saigon cinnamon and cane sugar. Served with sweetened condensed milk dipping sauce, it’s an Asian-inspired treat that you’ll soon be craving. The 2,047-square-foot restaurant’s front of house has digital menu boards, 100% reclaimed wood wall finishes, decorative steel accents, a larger-than-life mural of real Pei Wei wok chefs and the integration of the brand’s new tiger logo. LED lighting accentuates different seating areas throughout the dining room, which hosts multi-colored booths. Convenience is a substantial area of focus in Pei Wei’s new prototype. For take-out orders, guests can check the status of their order on a display screen that updates in real time and pick up their order from a new self-serve pick-up station. A special “Grab-N-Go” refrigerated cooler was installed for a wider selection of bottled beverages. Additional drinks include: Blue Sky craft fountain soda (made with 100% cane sugar), local kombucha and an updated beer, wine and sake lineup. McAllen’s new Pei Wei restaurant is open Sunday through Thursday from 11 a.m. to 9 p.m., and Friday and Saturday from 11 a.m. to 10 p.m.